From the desk of Rivera Sun comes a novel about the refusal of the human heart to submit to destructive authority. Under a gathering storm of tyranny, Zadie Byrd Gray whirls into the life of Charlie Rider and asks him to become the voice of the Dandelion Insurrection. With the rallying cry of life, liberty, and love, Zadie and Charlie fly across America leaving a wake of revolution in their path. Passion erupts. Danger abounds. The lives of millions hang by a thin thread of courage, but in the midst of the madness, the golden soul of humanity blossoms . . . and miracles start to unfold! Read more excerpts from The Dandelion Insurrection . 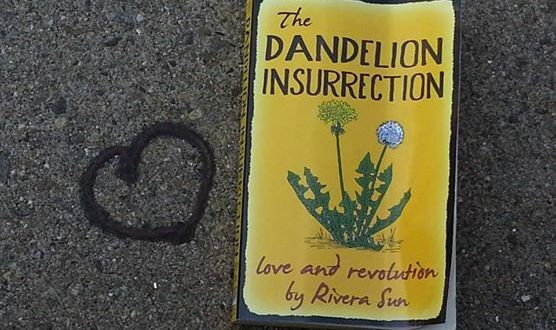 . .
“Rivera Sun’s The Dandelion Insurrection takes place in a dystopia just a hop, skip and jump away from today’s society. A fundamentally political book with vivid characters and heart stopping action. It’s a must and a great read.” – Judy Rebick, activist and author of Occupy This! “Written on the winds of hope, this book presents a political prophesy showing how a people united can defeat corporate/statist tyranny through the force of their will.” Steven Jonas, MD, MPH, author of The 15% Solution: How the Republican Religious Right Took Control of the U.S.: 1981-2022: A Futuristic Novel. “It’s rare phenomenon when a writer can move a reader to tears in the beginning chapters of a fictional novel. Wherein an inconceivable swelling heart calls the Soul forward to imagine its grand mythic journey as part of a great consciousness movement that delivers a bright future. Rivera Sun paints poetry on the canvas of ‘possibility and potential’, while pressure washing the grim dirty distortions of corporate/government/military collusion to reveal humanity’s fertile common ground smothered by capitalism’s greed for profit at all costs. ‘The Dandelion Insurrection’ is a personal invitation to engage life, love, and liberty as an evolutionary revolutionary dedicated to thriving cooperatively with the natural world, and each other, for shared existence to continue blossoming … like dandelions.” – Kevin ‘StarFire’ Spitzer, ‘Conciliation Sunday’ radio host, KZSC, Santa Cruz, writer, mentor, visionary thinker. I haven’t had any problems with it. I will check again. I have just discovered your site and book and although haven’t ordered yet I would like to quote from it for an essay due shortly at uni – I am currently studying Sustainability Management @ Murdoch University, Perth Western Australia. Is it possible for you to give me the correct bibliography Chicago Style Reference. Just testing the system here. Miigwech (Thank You), sister Rivera, for testing the system on my birthday. your new book blew into my life today like a cloud of dandy lyons from my dear friend Tom Hastings in Portland. You and I, dear new sister, have many years left to play in the flowers our seeds produce (I sow milkweed seeds for the butterflies….and I stop mining companies in Wisconsin)… and together as the older one and the newer one we shall awaken this land with smile power. Glad to find out you live in an earthship, long have I admired Michael Reynolds and his beautiful mind. Up here we build cordwood houses because we have lots of trees. Mnay blessings on you, sister! Can’t wait for our adventures together! Looking forward to enjoying your book – and hopefully meeting you one day. This book of poetry and art is a prayer for the wisdom to care for this planet with courage and compassion, and to share its life giving resources equitably. Love is not the easy way out, it is simply the only way to go. The living, conscious planet is warning us that human belief systems which do not consciously honor, observe, understand, and mimic natural life systems … are destined to fail. Forever. That book speaks beautifully to my heart.